Description: The body of P. dubia is brownish green with numerous rounded white or yellow tubercles. There are short white papillae on either side of the gills. This animal may grow to a length of 29mm. Habitat: P. dubia is only found sublittorally from depths of 10-100m. 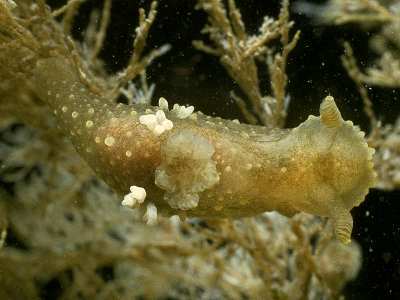 It feeds on the bryozoan species Eucratea loricata and Bowerbankia. Distribution: A northern species in the British Isles, but records have in the past been mixed with Palio nothus which has a wider distribution. Reliable records are from Belfast Lough, Loch Etive and the Oban area, and off Northumberland. Similar Species: P. dubia has been frequently confused with Palio nothus but differs in having rounded rather than conulate tubercles on the body, and even rather than blotchy green coloration. Yellow, rounded tubercles on the yellow-green body. 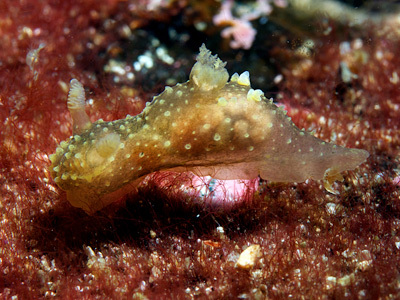 The rhinophores of P. dubia are shorter and bear more lamellae than those of P. nothus. Picton, B.E. & Morrow, C.C. (2016). Palio dubia (M Sars, 1829). [In] Encyclopedia of Marine Life of Britain and Ireland.